The Rock Mill sits on approximately seven secluded acres in the beautiful foothills of Farmington, Utah. It is fifteen miles from downtown Salt Lake City. 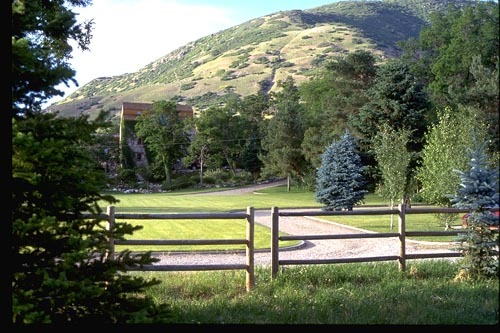 This rustic estate adjoins the Wasatch National Forest and affords magnificent views of the valley, mountains and the Great Salt Lake. The grounds include acres of manicured lawn, gardens, ponds, patios and pastures. In addition there is a corral and stable for horses. Numerous shade and fruit trees enchance the beauty of this tranquil property. It is the most significant LDS historical property in private hands, and it has the potential to be the grandest estate in Utah.